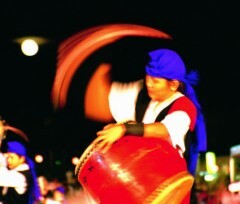 Okinawan Eisa is a form of performing art that is related to rites during Bon-festival, when ancestor’s spirits are believed to come to visit the living. Eisa is performed entertain the spirits as they as return after the three-day Obon festivals starting the 13th of July of the lunar calendar. Although originally a religious rite, it has evolved into a show performance.